Rocketstar Robotics has exclusive rights to provide ThinGap Coreless Winding Technology for spaceflight applications. This new technology is poised to revolutionize the spacecraft motor industry. Rocketstar Robotics, through an arrangement with ThinGap Corporation, is able to incorporate ThinGap's winding technology into its spaceflight motors and be an exclusive supplier of the technology for spaceflight applications. Rocketstar Robotics coreless motors are designed from the ground up as spaceflight motors using flight worthy materials, bearings and lubricants so they are extremely reliable in the space environment. Rocketstar Robotics Coreless Motors can be combined with any of our other components including harmonic and planetary gearboxes and / or telemetry devices to provide a complete actuator system. The basic design of the coreless motor allows for much lower weight, higher performance and more innovative packaging solutions. The advantages of Rocketstar Robotics coreless motors with ThinGap winding technology are significant. Power density [power (watts) / weight] is the amount of output power for a given weight. Increased power and reduced weight both contribute to a higher power density, which allows for the use of a lighter and smaller motor. Rocketstar Robotics coreless motors with ThinGap winding technology have industry-leading power density. Rocketstar Robotics coreless motors are lighter in weight. The elimination of eddy current and hysteresis losses increases efficiency and shaft power. Weight reduction is typically limited because iron losses are proportional to pole count. The use of high pole counts and thin magnetic iron increases power density in Rocketstar Robotics coreless motors. Hysteresis and eddy current losses lower a motor’s efficiency and output power. By eliminating the wire windings and iron core, ThinGap has improved the motor’s efficiency. ThinGap windings have very low resistance, which substantially lowers i2R losses. Hysteresis, caused by relative motion between iron and the magnet structure, typically creates motion control problems by pulling the rotor away from the desired position. ThinGap has negated this by eliminating relative motion of magnetic components. Rocketstar Robotics coreless motors have no cogging. There is no iron in the coil structure of the brush motor armature or brushless stator coil. All iron parts rotate therefore, cogging torque disappears and torque ripple due to harmonics is minimal. There is no magnetic pull between the rotor and stator. 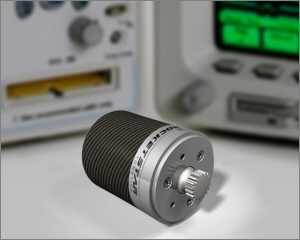 This is ideal for applications with low radial spring force constant. This is especially important when rotor stability is critical and motion from magnetic pull unacceptable. By removing the slots and lamination stacks, ThinGap has eliminated slot harmonics. In fact, there is no AC field in the iron and therefore no AC excitation of any acoustic noise. The only detectable noise comes from the bearings, if not a slight amount from the coil. Rocketstar Robotics coreless motors are responsive at any speed. Unlike conventional stators, which require a phase advance to accommodate high inductance, Rocketstar Robotics coreless motor current builds immediately, with only a small amount of voltage overhead needed for transient moves. Torque and acceleration can be changed instantaneously. Whereas significant voltage is usually required to change the current for more acceleration, current follows voltage in ThinGap coils. It is more easily controlled because low inductance gives all the characteristics of a resistive circuit. This also minimizes current overshoot. Rocketstar Robotics coreless motors have very low armature reaction. The torque constant is linear beyond the peak torque point, which is constrained by thermal, and not magnetic, limits. Whereas torque constant saturation causes losses at peak torque in wire-wound stators, Rocketstar Robotics coreless motors provide a measure of predictability. Due to the precise location of the coil elements and inherent smoothing of flux density in the air gap, Rocketstar Robotics coreless motors contain very low voltage harmonics. This provides exceptionally smooth, constant torque independent of rotor angle with sine drive controllers. This feature is especially useful for slow-moving objects (e.g., telescopes, optical scanners, robotics) and precision positioning, where smooth motion control is critical. Rocketstar Robotics coreless motors have an excellent thermal conduction path allowing for high levels of thermal dissipation and higher performance. Whereas conventional wire windings are embedded in lamination stack slots, the ThinGap coil is a thin, freestanding composite structure of copper, glass fiber, aluminum, and polyimide, with both the inside and outside surfaces to maximize thermal radiation heat transfer. In the absence of wire windings, the consistency of conductor configuration is not dependent on operator skill. Every Rocketstar Robotics coreless motor is built with automated, repeatable process control. 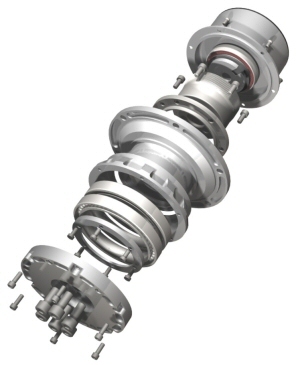 The stator and armature conductors are formed as a freestanding thin shell. There are no wires to cause stiffness or shape distortion. Only high-temperature tolerant materials (i.e., copper, glass fiber, polyimide, and aluminum) are used in the production of ThinGap coils.